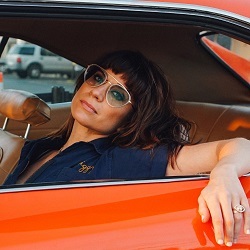 As February slips into March the lingering chills of winter will be dispelled in a half dozen places by the fiery Nicole Atkins who’ll be touring her latest album, Goodnight Rhonda Lee, which garnered good reviews all round last year. It was the tangible outcome from a whole series of life changes, not the least being a relocation from New Jersey to Nashville. At the same time she reconnected with her old friend Chris Isaak who encouraged her to write songs that emphasised the one trait that most sets her apart from the mere mortals of the industry, telling her, “Atkins, you have a very special thing in your voice that a lot of people can’t or don’t do. You need to stop shying away from that thing and let people hear it.” This encouragement led to a collaboration on the standout track A Little Crazy (you can find that under Tracks – it’s worth the effort). classic love songs originally sung by men about women, reimagined and without changing the gender. Tracks have been revealed on a monthly basis which has lead to Instant Love: Volume 1 being announced for release worldwide in January 2018. There’s a fair chance that the gigs will feature her take on Ryan Adams’ Amy – and, just in case, there’s also a chance to hear it right now.